^ "Yorkshire university secures place in top 10 institutions nationally in prestigious guide". www.yorkshirepost.co.uk. Retrieved 26 September 2017. 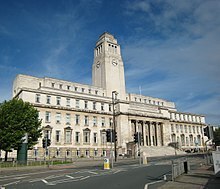 ^ "Leeds University is named 'University of the Year'". www.yorkshireeveningpost.co.uk. Retrieved 9 October 2016. ^ "New energy building unveiled at University of Leeds - EPSRC website". www.epsrc.ac.uk. Retrieved 15 January 2017. This page was last edited on 12 April 2019, at 13:37 (UTC).